Freshen up the party with our scented round travel candles! 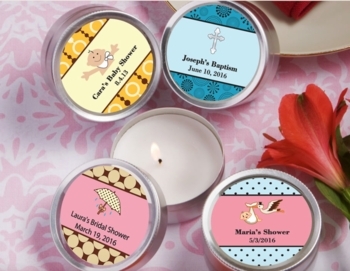 These candles are the perfect favors for occasions such as weddings, Christenings, Baptisms and of course...baby showers. Whatever the event, you'll be sure to create a one of a kind gift! Bring your ideas to fruition and personalize these candle favors quickly and easily. Choose from a wide array of themes, colors, designs, and titles to compliment the theme and color scheme of your party. Each candle measures 2 inches in diameter by 1 inch tall. They feature a silver metal base and a clear plastic top. Candles will arrive with your personalized stickers. Note - Assembly required: You apply stickers to each candle. Designing your own tags or stickers is easy! Just click the button to the right of the item photo to open the custom designer. After you create your design, simply click the "Submit" button which will automatically fill your design choices into the boxes on the right. Note: If it doesn't open, you may need to disable any popup blockers. Please call us at 866-476-0213 if you have any questions at all.